17 suspects, including Cumhuriyet daily journalists and executives who were arrested in November 2016, are ready to appear before an Istanbul court on Monday for the first time in an investigation into the Kurdistan Workers’ Party (PKK) and Gülen movement, which the Turkish government accuses of masterminding a coup attempt on July 15, 2016. An indictment drafted by the İstanbul Chief Public Prosecutor’s Office in April 2017, originally mentions 19 suspects that includes former Cumhuriyet Editor-in-Chief Can Dündar, who left Turkey before a failed military coup attempt on July 15. 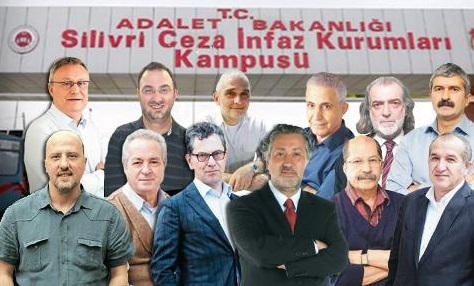 The suspects mentioned in the indictment are Cumhuriyet Editor-in-Chief Murat Sabuncu, the daily’s chief executive officer Akın Atalay, Editor Turhan Günay, editorial consultant Kadri Gürsel, member representative Güray Öz, cartoonist Musa Kart, columnist Hakan Kara, lawyers Bülent Utku and Mustafa Kemal Güngör, manager Önder Çelik, reporter Ahmet Şık, publisher Orhan Erinç, columnists Aydın Engin and Hikmet Çetinkaya, accountant Günseli Özaltay and a former employee Bülent Yener. The suspects were arrested by the İstanbul 9th Penal Court of Peace on Nov.5, 2016. Also, Atalay, was detained at İstanbul Atatürk Airport upon his return from Germany and subsequently arrested on Nov.12, 2016. The journalists face allegations of aiding the PKK, far-left Revolutionary People’s Liberation Party/Front (DHKP/C) and FETÖ. FETÖ is a derogatory term and acronym for the Fethullahist Terrorist Organization, coined by President Recep Tayyip Erdoğan and the Justice and Development Party (AKP) government to refer to the Gülen movement.